Ehrlich's Reagent is a solution of hydrochloric acid, ethanol and p–dimethylaminobenzaldehyde. 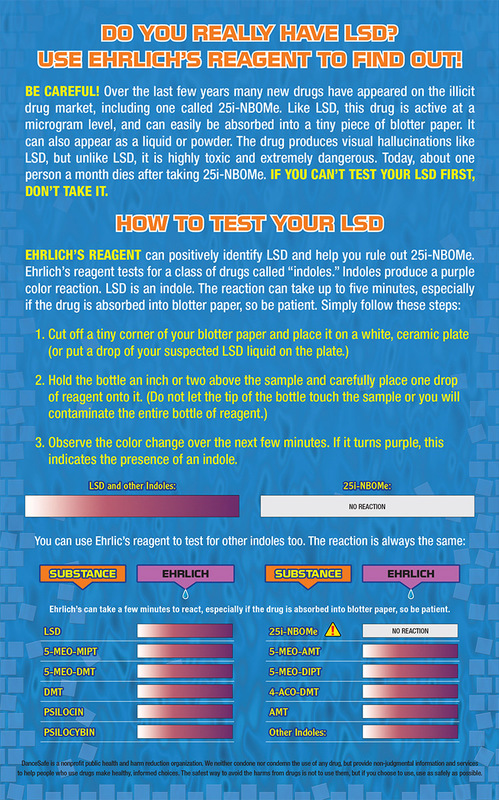 It can be used to positively identify LSD, helping rule out 25i-NBOMe, a highly toxic and extremely dangerous drug that is often misrepresented as LSD. Ehrlich's can also be used to identify other indoles. Ehrlich’s Reagent contains hydrochloric acid and is strong enough to burn skin and clothing. Keep out of eyes and mouth. Wear latex gloves when handling the bottle and cap. If you get some on you, then wash quickly with soap and water. Wash testing surfaces with soap and water as well. Dispose of any unwanted reagent down the sink with running water and baking soda. Store all testing kits in a cold, dark place (like your refrigerator) between uses. NOTE: Ehrlich’s reagent can only determine the PRESENCE of an indole, not QUANTITY or PURITY.